These kits will ONLY fit a standard 3 x 7 door. Some field trimming/cutting/modifying may be required for exact fit. If door swings into the room - Kit goes on OUTSIDE of door. If door swings out of the room - Kit goes on INSIDE of door. Please Note: Door Bottoms are not designed to seal directly on carpet. 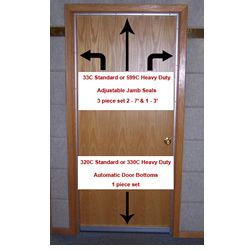 For best result door bottoms should seal on a solid surface. The solid surface should be positioned above the level of the floor covering on either side of the door.